Explore Kananaskis, Winter/Spring 1997—Covering more than 5,000 square kilometres, Alberta’s Kananaskis Country encompasses everything from foothills in the east to the rock, alpine Continental Divide in the west, from the wide, windswept Bow River Valley in the north to narrow passes and valleys in the south. With such variety in terrain, elevation and exposure, one of the few things you can count on regarding weather in the wilderness region is that is it unpredictable. The adage, “If you don’t like the weather, wait five minutes,” applies. Winter in Kananaskis starts in November and lasts until March. Unless it starts in September. Or ends in May. There are years when an early drop in seasonal temperatures lowers the snow line soon after Labour Day. There are as many years when winter blasts on and on until June, at which time summer arrives, bypassing spring altogether. Kananaskis Country generally has two continental weather systems in play during winter. Frigid, dry Arctic systems from north or east blow without resistance over the prairie until they smack into the Rocky Mountains. These ramparts of stone funnel and deflect the air-flow southward. The arrival of these systems usually means cold temperatures and ice crystals in the air. These systems can also dump snow in the foothills while bypassing points further west. Contrast that with the Pacific weather that blows in from the west coast. These systems tend to be warmer than Arctic systems, and are laden with moisture that falls as rain in Vancouver and turns to snow as they are forced up the staircase of mountain ranges across British Columbia. By the time the systems arrive at Alberta’s western reaches, the majority of the moisture has already condensed into clouds and precipitated out on the western side of the Continental Divide. The amount of snow lessens the further east a wintertime Pacific system extends. Thus, West Bragg Creek, on Kananaskis Country’s east side, receives less snow from these systems than does Peter Lougheed Provincial Park, abutting the Continental Divide to the west. 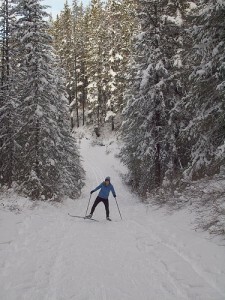 Kananaskis Country is home to some of the best cross-country skiing in Canada. Photo by Adam Kahtava. Elevation influences the differences in snowfall and accumulation between east and west Kananaskis Country. The higher you go, the colder it gets, the more likely that what precipitation there is will fall as snow, not rain. Snow accumulates; rain does not. However, to every rule, there is an exception. Although higher elevations usually do mean lower temperatures, diehard winter outdoor enthusiasts have been known to leave Calgary where it is –35° C and spend a sunny day on Peter Lougheed Provincial Park trails in balmy –10° C temperatures. This winter phenomenon is called temperature inversion, and occurs frequently in this part of the world. Arctic high-pressure systems spread a thin layer of cold, murky and sometimes polluted air over the prairies and foothills valleys. One of the warmer western systems—as much as 15° C warmer—sits above it, trapping the cold air below. To find out when to take advantage of a temperature inversion, compare Environment Canada’s Calgary forecast to its Banff forecast. If it’s warmer in Banff, temperature inversion is occurring. East–west differences in snow accumulation can also be affected by recurring Chinook winds. Chinooks are a distinctive part of the Pacific weather system: as many as 10 times each winter, they blow in from the west, gradually chilling and dumping snow as they climb the British Columbia mountain staircase. With one final dump on the Continental Divide, a now-near-dry Chinook wind flows down the mountains to the plains, skipping over the Rocky Mountain front ranges and foothills like a rock skipping over water. As the wind descends, its temperatures rise faster than they had cooled on the ascent. Somewhere over the eastern edge of the front ranges, the Chinook encounters a very cold, Arctic high-pressure system locking the prairies in its frigid grip. What moisture remains in the Pacific systems condenses, forming a distinct arch of cloud along the line of the mountains. The Chinook Arch announces a dramatic reprieve from winter. Temperatures can rocket from –30° C to +10° C in a matter of hours. Snow vanishes. Gutters fill. Spirits rise. Calgarians go home in the shirtsleeves, lugging parkas in their arms. Elk and deer, and antelope on the prairies further east, can feed and move about easily again. Points west in Kananaskis Country tend to be frequently skipped over by Chinooks. Although these winds do occur in Peter Lougheed Park and the Spray River Valley, they tend to be weaker and more ephemeral there. The Bow River Valley sees the most Chinooks of all of Kananaskis, often serving to funnel them east out of the mountains and onto the plains.